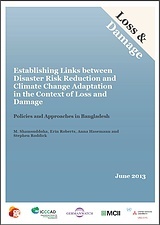 The overarching aim of this paper is to examine the challenges of addressing loss and damage through national institutional arrangements that integrate disaster risk reduction (DRR) and climate change adaptation (CCA) in Bangladesh. As DRR and CCA share many aims and methodologies, greater synthesis and coordination between these two fields will help to eliminate redundancy, increase cost-effectiveness and leverage the respectiveÂ advantages of each. This will be increasingly important in the years ahead, as climate change will bring a range of impacts that affected populations will not be able to adapt to. 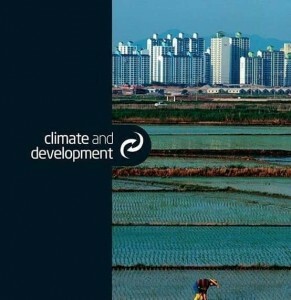 Therefore, a policy and institutional framework that takes an integrated approach to facilitating adaptation (where possible) and addressing loss and damage (where unavoidable) by combining the theory and practice of DRR and CCA will likely help reduce loss and damage and build climate resilient communities. To this end, this paper analyses DRR and CCA policies, strategies, institutions and approaches and identifies areas where greater synergy may be achieved for addressing loss and damage in the national context of Bangladesh.